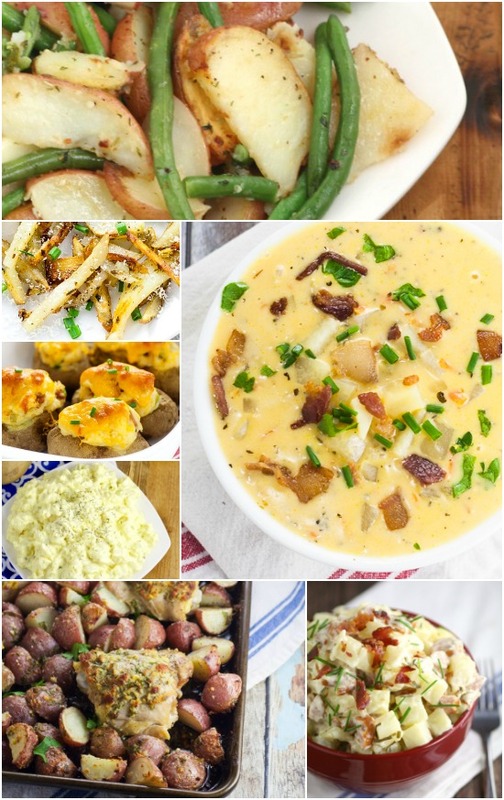 You can save money by making some frugal meals to stretch your food and your money with these 11 yummy and filling Cheap Meals to Make with Potatoes. Potatoes are one of my favorite grocery items to cook with. They are inexpensive and make a great, filling ingredient in your main dishes. 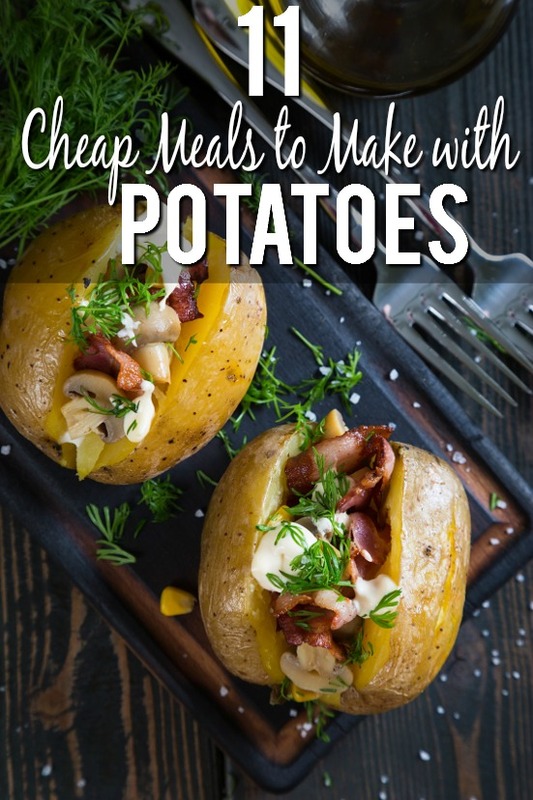 When you don’t have a lot of money to spare on groceries, you can really utilize potatoes to make inexpensive meals and stretch your food and your dollars. Here are 11 cheap meals to make with potatoes. 1. Baked Potato Bar – One of my favorite meals ever. 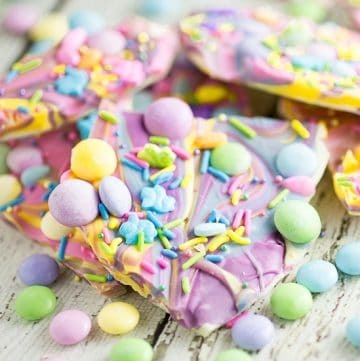 Super cheap to make and everyone will love being able to add their own toppings. Try the classics like bacon, cheese, sour cream, butter, and chives. Or you can get a little creative with items like leftover pulled pork, or buffalo chicken pieces. Have fun with it! 2. 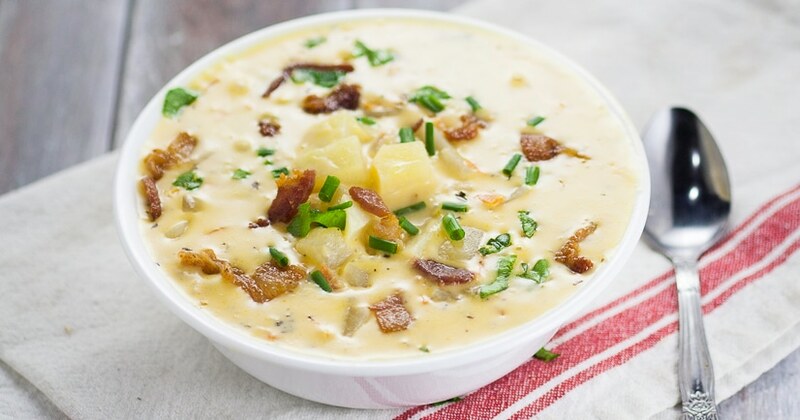 Potato Soup – I don’t care if it’s cold or warm out, potato soup will always be one of my favorite kinds of soups, and one of my kids favorites too. This is my favorite stove-top Cheesy Potato Soup Recipe, or you can use Crock Pot Cheesy Potato Soup recipe in the Summer when you’d rather not use the stove. You can also make a large batch of potato soup to freeze, and use it for dinner again or split it into lunch-size portions. 3. Shepherd’s Pie – If you have never eaten Shepherd’s Pie, this is something you need to add to your monthly grocery menu. 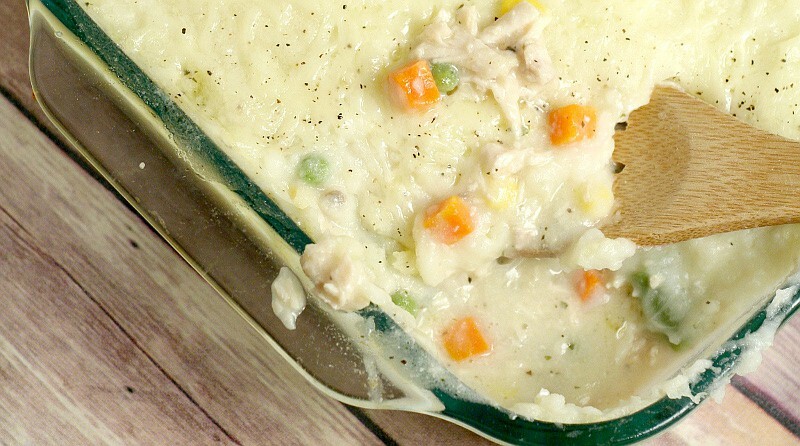 Traditional shepherd’s pie is made with ground beef, but I like this Chicken Shepherd’s Pie recipe which is made with chicken, and is usually a little cheaper for us (since ground beef has been kind of pricey lately). It’s a super simple dinner recipe that anyone can make. 4. Fried Potatoes – Want to fill up that crew of yours? Fried Potatoes make an excellent main dish or side dish. Easy to make and filling to the core. You can make these fun by cutting them in different shapes like wedges, coins, wavy, or skinny fries. 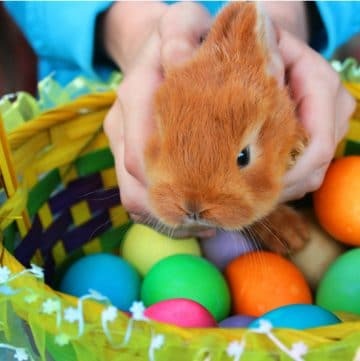 You can also pan-fry or throw them in a deep fryer or even an air fryer. Plus, you can even get creative with toppings and dipping sauces. Ketchup is always a fan favorite, but consider a making “campfire sauce” made from 2 parts of your favorite barbecue sauce and 1 part mayo. It’s one of my favorites. Or put some easy toppings on your fries, like chili, shredded cheese, or cheese sauce, sour cream, etc. The possibilities are endless because potatoes are so versatile! 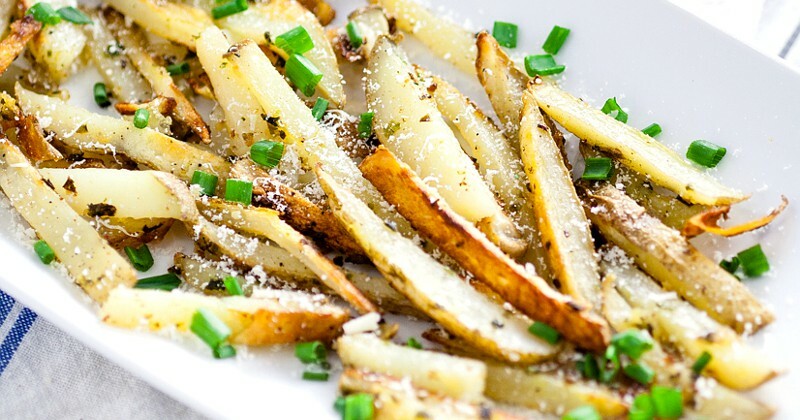 One of my favorite recipes is this Garlic Chive Baked Fries recipe. 5. 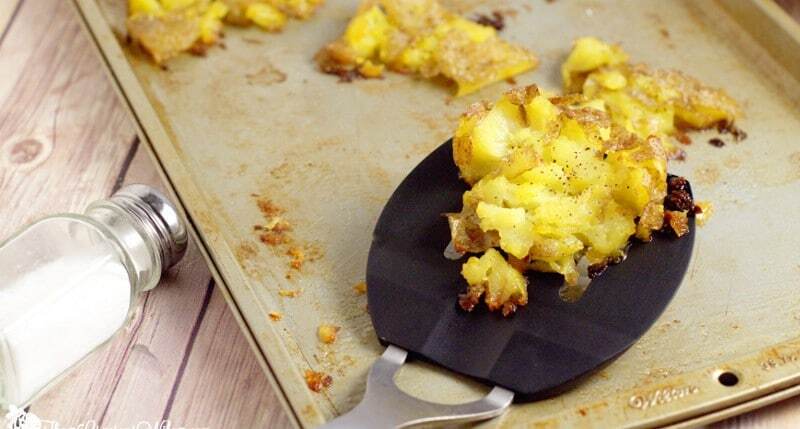 Potato Gratin– This dish is probably recognizable because most people buy it in the box. 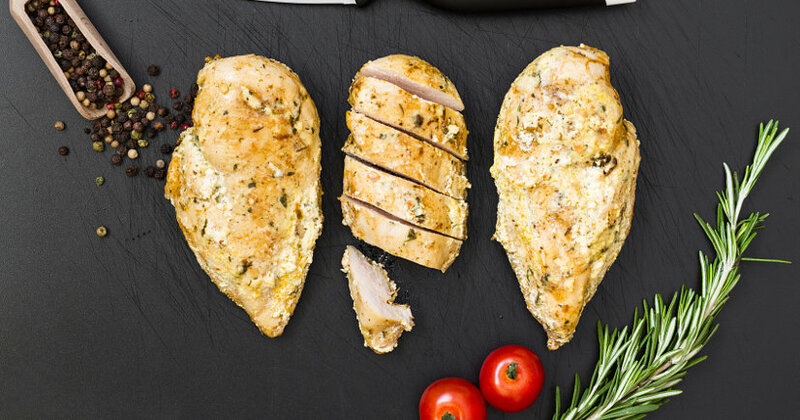 However, you can easily make this dish in your own kitchen for much cheaper (and healthier). 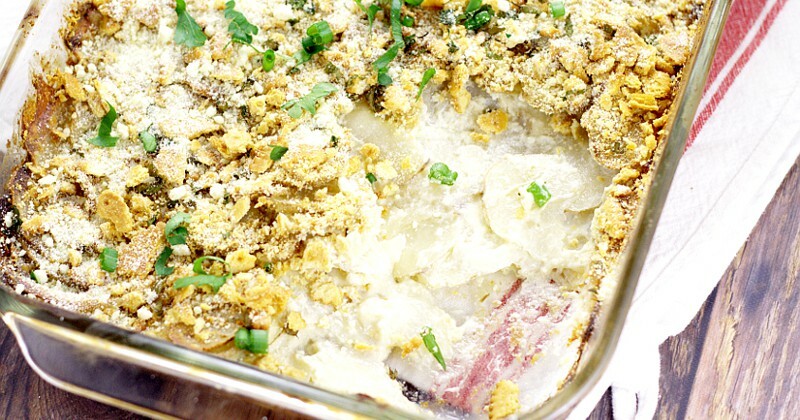 You could also make scalloped potatoes like these super yummy Dijon Scalloped Potatoes. 6. 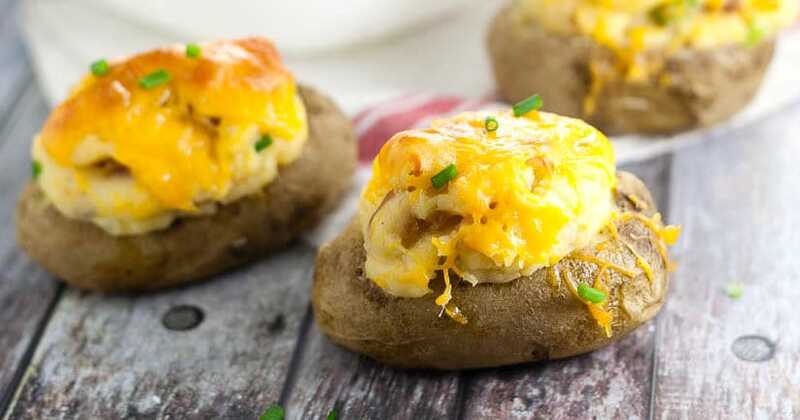 Twice Baked Potatoes – Because once baked isn’t enough. 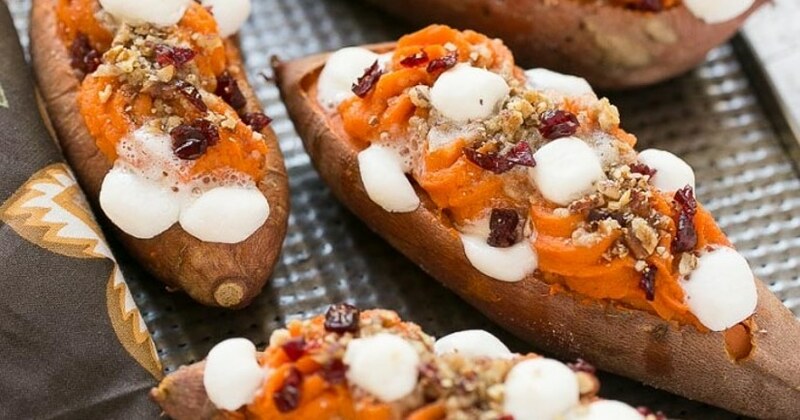 Stuffing those already baked potatoes with yumminess is sure to make your crew happy! Try this Twice Baked Deviled Potatoes. 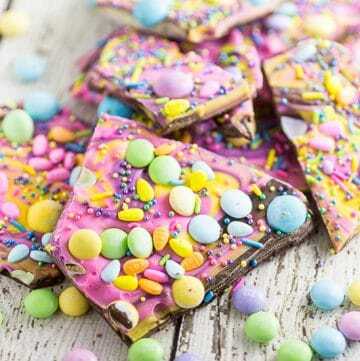 They’re one of our family favorite recipes! 7. Don’t forget the Mashed Potatoes – There have been many times where Mashed Potatoes were our go-to main dish! You can make mashed potatoes in so many ways, which makes it an awesome cheap meal to make with potatoes. 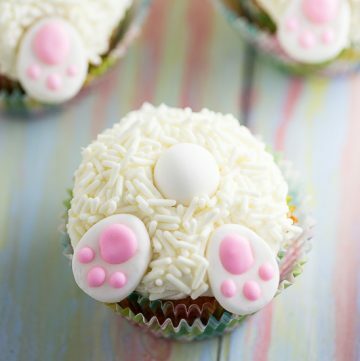 Plus they’re super easy to make. You can even make them in the microwave by poking holes in the potatoes and cooking them in the microwave, then mashing and adding milk and butter. So simple. Whip up some gravy, or throw in some simple add-ins like herbs or cheese to keep it interesting. 8. Potato Salad – Potato salad is, of course, a Summertime picnic favorite, but it can be a yummy dish all year long. It’s another one of those dishes that you can get creative with as there’s SO MANY potato salad recipes out there. I’ll share 2 of my favorites to get you started. 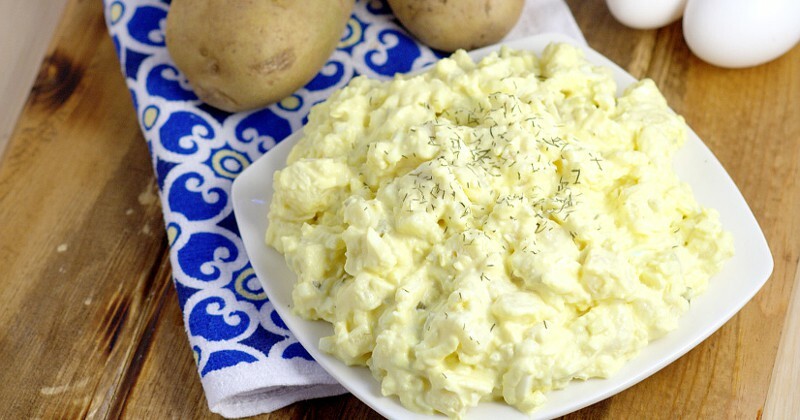 This Best Potato Salad recipe is close to a classic Southern-type potato salad recipe. Creamy with some mustard, and a little kick of spicy for some extra flavor. This Deviled Egg Potato Salad recipe was inspired by none other than deviled eggs and features hard boiled eggs, mayo, and mustard. I love both of those recipes, and I’m really not even that big of a fan of potato salad! 9. Cheesy Potatoes – I don’t think there is anything better in the world than Cheesy Potatoes. Cheese makes everything better, especially potatoes. 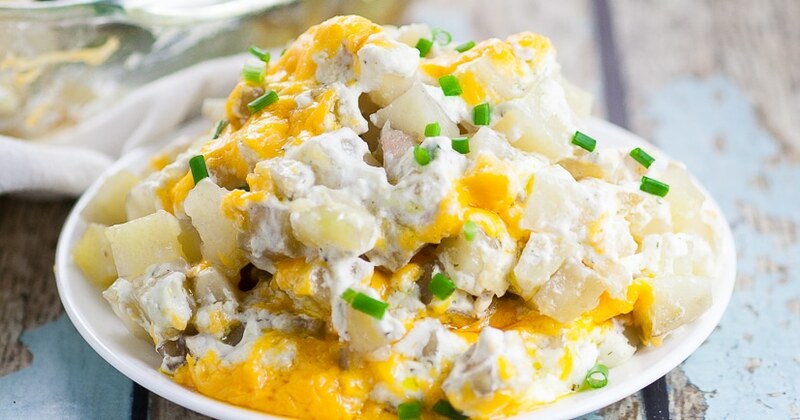 Most of the time, I’ll turn our cheesy potatoes into a casserole, like this Crock Pot Cheesy Hash Brown Casserole or these Creamy Slow Cooker Potatoes with Sausage and Chives. 10. 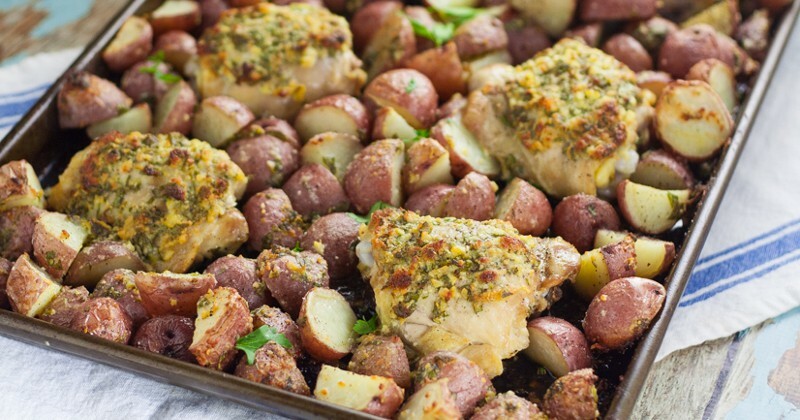 One Pan Meals – Using a meat, vegetable, and potatoes, you can easily make so many one pan meals. One of my favorites is chicken, green beans, and potatoes like in this One Pan Garlic Roasted Chicken and Potatoes recipe. Or you could skip the meat all together like in this Garlic Herb Roasted Potatoes and Green Beans recipe. 11. Skillet Dinner – You can also make skillet meals using potatoes for pretty cheap. Adding a meat, veggie, and potatoes in your skillet—you can make a delicious meal. 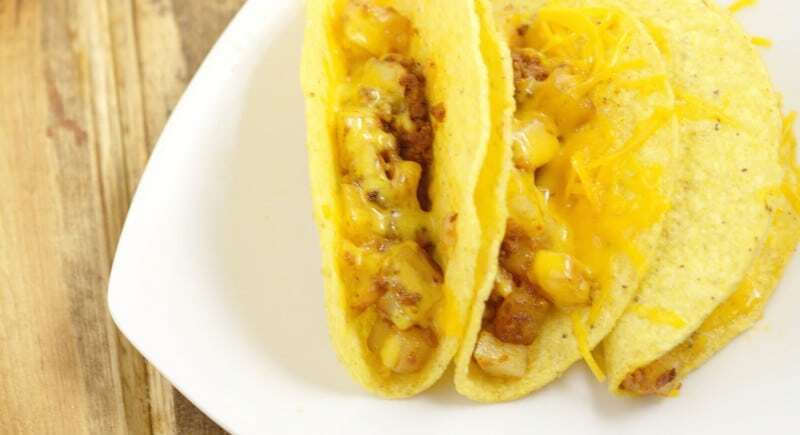 Or try these Chorizo Potato Tacos. Cook it all up in the skillet and serve it in a tortilla or crunchy taco shell for a quick, easy, and frugal dinner. What is your go to cheap meal using potatoes? Did you like these 10 Cheap Meals to Make with Potatoes? 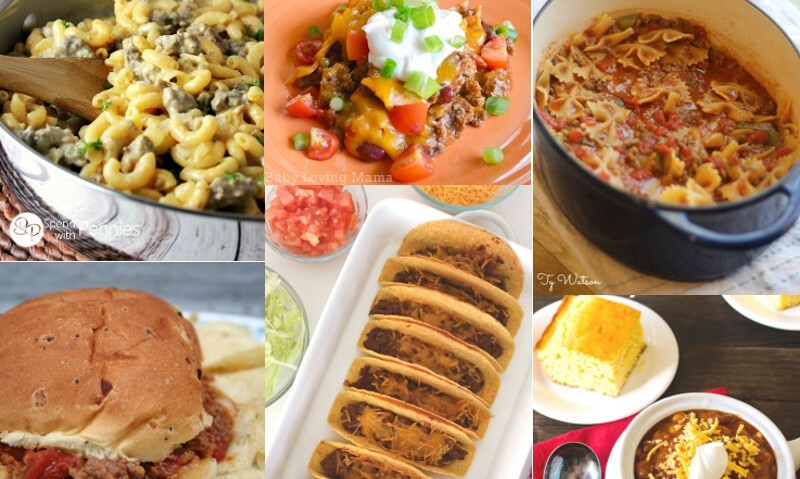 Find more on my Dinner Ideas, Salads & Sides, and Frugal Living boards on Pinterest!